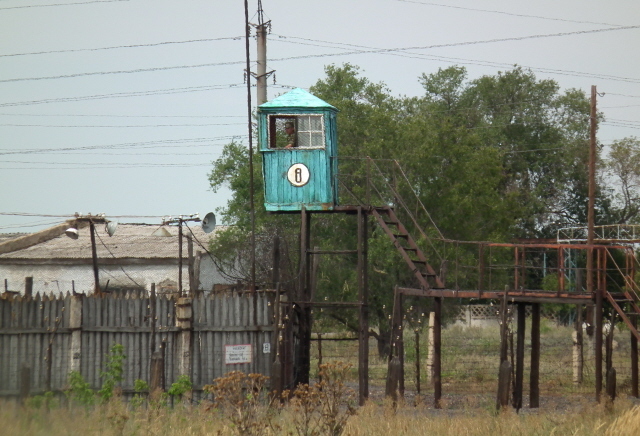 A memorial museum about the Soviet Union's gulag system in the area of Karaganda, Kazakhstan, which had its headquarters here in the village of Dolinka. In addition to the heavily commodified new museum exhibition, there are a few authentic relics of the gulag, as well as a cemetery, also located in Dolinka. Together with the ALZHIR memorial near Astana, this KarLag memorial is one of the most essential dark tourism sites of its type in the whole of Kazakhstan and beyond. In fact the term "KarLag" is a sort of blend of 'gulag' and 'Karaganda' (more precisely: short for "Karagandinstky Lager") – the latter being the name of both the central province in the Kazakh steppe as well as that of its regional capital city. KarLag was not just one camp but a whole system of gulags, consisting mostly of various separate hard labour camps spread out over a huge area in the endless steppe. The type of forced labour the inmates had to perform ranged from the construction of roads, canals and other industrial infrastructure, even cultural palaces, to manufacturing of army uniforms and agriculture. At peak times up to 66,000 prisoners were held here, in hundreds of sub-camps. Estimates as to the total number of prisoners that went through KarLag over the years are often put at ca. 800,000, although a few sources go as far as suggesting several millions, which is probably an exaggeration. The KarLag gulag system was first founded in 1931 – and finally disbanded in 1959, i.e. a few years after Stalin's death, when the new regime under Nikita Khrushchev changed course and tried to undo some of Stalin's wrongs. Apart from internal political prisoners from all over the Soviet Union, Stalin had the whole of the German ethic minority from the Volga region deported to the Kazakh steppe when Germany invaded the USSR in WWII. Simply being of German ethnicity was enough to make them all suspect as potential traitors. The German link was continued after WWII, when many young men (often young teenagers rather than adults) captured in defeated Germany were (mostly wrongly) accused of being "werewolves", i.e. underground Nazi saboteurs, and were sent to the labour camps in Siberia and, in particular, KarLag. Ironically, some had previously been held in the Soviet "special camps" in Germany, in what used to be Nazi concentration camps (such as Buchenwald and Sachsenhausen). The city of Karaganda owes much of its industrial development as well as some grand inner-city buildings, e.g. the Miners' Cultural Palace, to forced labour from the KarLag camps. The administrative centre of the KarLag system, however, was located in the village of Dolinka, some 20 miles (36 km) south-west of Karaganda. And it is here in Dolinka that the history of KarLag is being commemorated – now even commodified on a truly large scale. Up until quite recently there was only one rather small and half-hearted museum, housed in an old hospital ward building, with a single-room exhibition. The 2008 Bradt guide to Kazakhstan already mentioned the authorities' "ambitious plans" to move the museum in a much expanded form to the restored former main administrative building of the KarLag system. These plans have meanwhile come to fruition. The palatial, column-fronted edifice now houses a massive exhibition on two floors in two long wings – it was opened as recently as May 2011. This costly development clearly shows a perceived need to commodify the KarLag history. And the new exhibition does so with panache! It may attract criticism for putting just a little too over-emotional an emphasis on Kazakh victimhood and for including a not altogether fitting patriotic celebration of independent Kazakhstan. But still, the new memorial museum is without doubt the best effort yet to commemorate this dark chapter in history in Kazakhstan. It is thus one of the top dark tourism destinations of its kind in Kazakhstan and an absolute must-see when travelling to the Karaganda region. What there is to see: arriving at the new museum, housed in the refurbished former headquarters of the KarLag administration, you might find it hard to believe that this palatial edifice is supposed to have been the nerve centre of something as cruel as a gulag system. In fact, the imposing building was designed to instil fear of the authorities. Today, with it's newly painted facade of pale grey and white, the only thing that hints at its former function is the big bright-red Soviet star set in the centre of the frieze of the main portal above the columns. The source of all evil is quickly identified through an installation in the centre of the main hall as you enter: a huge wall mural of Josef Stalin looks out grimly from behind a scaled-down mock watchtower – his eyes level with the tower's observation platform. The message is clear: that bad big brother is watching you! In fact, as you go through the exhibition, you'll encounter Stalin's eyes painted onto walls and in between exhibits as a constant reminder as to who was to blame for it all. True as that may be historically, it's a bit of sledgehammer approach from a museum-design point of view. The main corridors along the two wings of the museum are uniformly designed to resemble camp fences, complete with barbed wire, grille-like features on the ceilings and wooden slats along the walls which contain display blocks. These show mainly pictures and personal files of prisoners. The exhibition rooms branching off the main corridor first go through the history of collectivization in the early Soviet Union, which brought an end to the traditional nomadic life style in Kazakhstan. Large paintings depict scenes of Soviet soldiers forcibly removing village chiefs, dismantling yurts and committing other such cruelties. Next is the red terror – and famine – of the 1930s. One shocking element here is a photo of a baby in a haystack – allegedly kidnapped to be eaten but rescued by scientists (who took the picture). There are a few personal stories covered to further individualize the horrors. The main emphasis, however, is predictably on the KarLag system as such. There's a photo of the administrative building the museum is now housed in as it was built by forced labourers from the camps. A map shows the huge area the various sub-camps were distributed across (compared to a map of France) and artefacts on display include items such as handcuffs, cigarette cases, stretches of original barbed wire, and a piece of railway track used as a gong to summon prisoners to receive their food rations. The occasional rebellions staged by prisoners are also covered (in particular at Tokyrau and Bokty), e.g., again, through large paintings. The nature of the work performed in the camps is covered in quite some detail, from making mud bricks to record-breaking scientific or engineering achievements, e.g. in irrigation systems. Cattle breeding, too, produced some prize-worthy success, both in the form of new breeds as well as in particular individuals (a cow giving record amounts of milk, a star ox called Laur …). Mining and industrial achievements are pointed out, as well as the importance of the camps for war production (ammunition and weapons). Many a scientist was imprisoned at KarLag too, including Nobel Prize nominees, and a scientist's lab mock-up demonstrates the slightly better living and working conditions of these more privileged inmates. 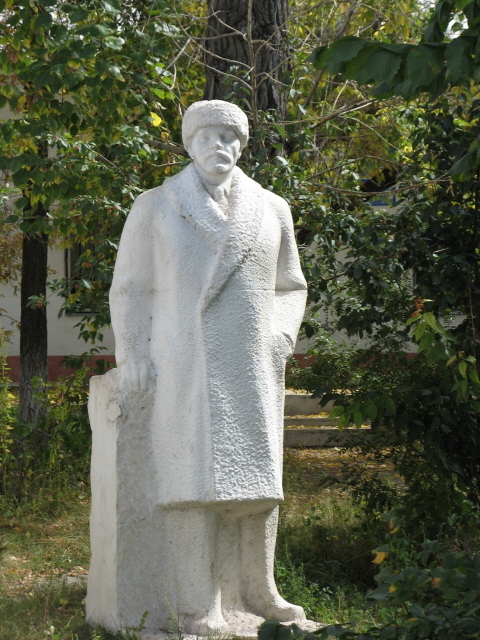 One scientist picked out is Alexander Chizhevsky who was a pioneer of bio-physics and, amongst other things, developed air ionization therapy techniques used to treat depression! What a fitting link, then, to the gulag theme. The depressing issue of the fate of orphans is picked up in a special room too, incorporating a small original cot/playpen, felt boots, letters and pictures (also one of the Mamochkino cemetery – see below). In this context one painting showing Stalin surrounded by happy kids is particularly sarcastic evidence of the double-speak of the time. The exhibition down in the cellar in the bowels of the building is particularly stark. Here, reconstructions of the prisoners' living quarters are shown, complete with dummies looking suitably sad and dejected. Especially dark in their theme are the reconstructed torture cells: chains hanging from the ceiling, all manner of other torture implements, and mock blood stains on the walls. The mock interrogation rooms exude a similarly sinister atmosphere. Whether torture actually took place down here is somewhat contested, though. Locals claimed they could hear the screams of torture victims, and say it was a "well-known secret". However, there are no documents or other hard evidence to actually support this. Still, it makes for nice and shocking museum mock-up material, so why be pernickety. Other parts of the cellar level contain a punishment cell – basically a hole in the floor with a metal grille on top (another reconstruction, of course), holding cells, and at the far end a red-lit room behind bars with a white-clad mannequin facing the wall … apparently awaiting execution. A side room is full of barrels. The accompanying story goes that in winter corpses were stored together with salt for preservation in such barrels until they could be buried in the spring when the ground had thawed enough – in winter it would have been frozen solid. On the second floor, the exhibition continues on a less dramatically visualized level. Here, more individual stories are picked up. There are numerous photos and documents, including a whole list of people who at the end of their sentence, instead of being released, were simply shot. The heavy influence of the large contingent of ethic Germans in the KarLag system is, amongst other things, also evidenced by a piece of cloth with the embroidered legend "Der Herr ist mein Hirte" on it. This translates literally as: 'The Lord is my shepherd' – you just wonder where the shepherding led to … to a hell on Earth, ultimately. Still the God-fearing religious feelings of the inmates were apparently unshatterable. Another section deals with the KarLag library. Yes, there was a library for the prisoners – albeit, one of very restricted choices. Fancy reading Stalin's biography while being incarcerated in a gulag! Amongst the exhibits here are original books bearing the stamps of the KarLag library, and even a genuine copy of the camp newspaper, called "Putevka" (translated on the accompanying label as 'start', though this was contested by my guide who claimed it should rather be 'trip'). Finally in the upstairs part there is also a section about art, both art commissioned from painters in the camps (i.e. paintings glorifying Lenin and such like) as well as a contemporary piece, which in an intriguing (and very dark) way was portrayed the "life cycle" of the gulag – from arrival to burial … and the spiritual afterlife. Back downstairs on the ground floor, there are a couple of final sections focusing more on Kazakhstan itself. It ranges from repression to struggle to independence. In particular the events of December 1986 are pointed out again (see Almaty and the Museum of the President's Cultural Centre in Astana). The museum finishes with a contemporary flourish of patriotism – in a room decked out in the national colours and with lots of images of President Nazarbayev, the architecture of the new independent Kazakhstan (i.e. mostly Astana) and its general greatness. My guide's enthusiasm was noticeably dampened here. At one point the remark was dropped that basically the red-colour theme of the communist old days had simply been replaced with the current one of blue and yellow, as in the national flag of independent Kazakhstan. Still, like everybody I met in Kazakhstan, she acknowledged the role of Nazarbayev as a kind of guardian of the country's stability, and it sounded quite genuine. Not all parts of the building are accessible at present – more expansions are apparently in the planning stage. But even as it is, the exhibition covers a lot of ground indeed. It must certainly be the most elaborate such exhibition anywhere! Labelling is partly trilingual (Kazakh, Russian and English), but partly in Russian and Kazakh only – and original documents are in the original only (i.e. without accompanying translations). So a live guide still makes sense to bring the exhibition to life and provide relevant information you couldn't glean from the exhibition on your own. Apart from visiting the museum, you can also find traces of the KarLag at Dolinka that are less obvious, and significantly less commodified. First of all there's the former museum building just down the road: a single-storey low building of classic Russian design with two columned portals. Spot the roughly life-sized white statue of Lenin standing on one side, clad, fittingly, in thick winter attire – fur hat, felt boots and a heavy coat. Some of the low buildings around the village, so the guide pointed out, are actually genuine ex-gulag barracks. Some are derelict, lending them a darkly atmospheric quality, others refurbished and lived in – complete with satellite dishes! There are also more former administrative buildings, including a couple that are in ruins. Somewhat ironically, if not shockingly, there is still a contemporary prison at Dolinka! You can see it on your way into or out of the village. It's a cluster of yet more low, shabby single-storey buildings – but these are still surrounded by a fence with barbed wire, and watchtowers on the corners are still manned by guards. The presence of this prison adds another distinctly dark edge to a visit here. The main element, however, remains the new, elaborate museum. And even though there are some elements you may find fault with (especially some of the exaggerated depictions and the over-emotionalizing elements such as the constant sombre music), it is still a major dark tourism destination in Kazakhstan that is not to be missed. An essential element of any visit to the Karaganda region anyway, but also worth travelling for in its own right! Location: ca. 25 miles (40 km) from the city of Karaganda, in central Kazakhstan. The new memorial museum is ca. a mile and a half (2.3 km) south of the turn-off from the main road from Karaganda. The mothers' cemetery is located another ca. two miles (3 km) to the south of Dolinka proper, in a field to the west of the neighbouring village of Zhartas. Access and costs: a bit off the beaten track and best done as a guided excursion from Karaganda, which isn't particularly cheap, but well worth it. If you have your own means of transport proceed as follows: From Karaganda take the road heading south-west towards and past Shakhtinsk (a mining centre – "Shakht", like "Schacht" in German, actually means 'mining shaft'). Just past the turn-off for Novodolinsk to the right take the next turn left (just after the petrol station), which will take you into Dolinka proper. About a mile down the road you pass the local prison on your right. Carry on straight and take the third turn-off to your left, which should take you to the new museum's car park. The old museum building (with its white Lenin) is just to the south of the new complex, but to locate other relics of the gulag system in Dolinka you'll probably need a guide to show you around. To get the most out of it I recommend doing this as a guided excursion from Karaganda. Nomadic Travel, based at Karaganda's Ecomuseum, offer such tours in their portfolio, for instance. They charge ca. 27,500 KZT (museum entrance fee included) for groups up to five to six persons for a six-hour excursion to Dolinka and Spassk (doing just the four-hour trip to Dolinka only, which they also offer, costs hardly any less, so doing the combination tour is highly recommended). If you're going as just a single individual, this is quite expensive, of course (and the overall price doesn't change much when travelling with more people, you just share the cost). However, as part of the package you not only get transport and a full guided tour of the museum, in good English, but also a drive around Dolinka village to take you to various points of interest that you may otherwise not be able to find. So it is value for money after all. You can also pre-book such tours as part of a longer itinerary when using the Dutch specialist operator Kazakhstan Tours, which is given its own sponsored page here. Opening times of the museum: Tuesday to Sunday 10 a.m. to 6 p.m. (closed Mondays). Admission: 300KZT (for foreigners – locals pay less, probably only half that). If you do not come with your own guide, then the museum will send one of their own along with you ... lest you explore on your own unwatched. It's quite common practice in these parts. Photography was restricted when I visited, in a most ridiculous manner: I was supposed to pay 300KZT per shot! And it was policed: a guy from the museum trailed us through most parts of the museum to make sure we didn't sneak in any extra surreptitious photos! (I managed a few nevertheless ...) Given that they make so much of that scary Stalin-is-watching-you theme, I found it quite ironic that they play this suspicious scrutiny game themselves. UPDATE: I've been informed that this regime has meanwhile changed: now they charge a flat rate of 750 KZT for a general photo permit (unlimited number of shots). Time required: the guided tour of the museum that I was given lasted about two hours, which felt perfectly adequate. During my visit, though, I also saw local visitors rushing through the exhibition at significantly greater speed. Add time for a look around the other places of interest in Dolinka and driving time from Karaganda, and you need to allocate at least four hours altogether. In combination with Spassk, the guided tour takes six hours. Combinations with other dark destinations: there's one other gulag-related memorial in the Karaganda region: Spassk (though it's only a set of memorial stones in a field of graves, so not as commodified or extensive as the museum at Dolinka). It can be combined into a single-day excursion with a visit to KarLag, even though it is a bit of a roundabout route. Nomadic Travel, based at the Ecomuseum in Karaganda, offers such tours, for instance (see access and costs). Thematically related is the ALZHIR memorial, also a gulag site, which is, however, located quite a bit further north, and best accessed as a half-day excursion from Astana. Closer by, the city of Karaganda also has a few points of interest to the dark tourist. Combinations with non-dark destinations: see Karaganda.